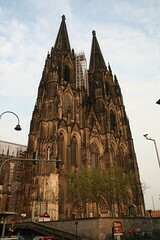 Friday continues as we hop a train from the airport and arrive in downtown Köln, in the shadow of the Dom. After picking our jaws up off the ground, we hike down to the Chocolate Museum, wherein we witness much chocolatey goodness. Continuing the train theme, we take the Shoko-Express from the Museum back to the Dom, where we wander around the interior for a while, followed by dinner at Hausbrauerei Päffgen, where we discover the joys of Kölsch, the local beer, and make friends with a bachelor party. We do a bit of sightseeing and souvenir shopping as we walk back toward the Dom (finally getting some good light on this otherwise grey and difficult photography day), then take the train back to the airport, by which point it's time to head back to the hotel and make sure we're all packed up for our return to the US. At this point the map gets a bit moot; this batch of photos is all at number fifteen on the itinerary.